Ludwig van Beethoven (baptized 17 December 1770 – 26 March 1827) was a German composer of classical music, who lived predominantly in Vienna, Austria. Beethoven is widely regarded as one of history's supreme composers who produced notable works even after he completely lost his hearing. He was one of the greatest figures in the transitional period between the Classical and Romantic eras in music. His reputation has inspired — and in many cases intimidated — composers, musicians, and audiences who were to come after him. Among his most widely-recognized works are his Fifth, Sixth and Ninth symphonies (the latter containing the "Ode to Joy"); Piano Concerto No. 5 ("Emperor"); a Violin Concerto; the Pathétique, Moonlight and Appassionata piano sonatas; and the Für Elise bagatelle. Beethoven was born at 515 Bongasse, Bonn, Germany, to Johann van Beethoven (1740–1792), of Flemish origins; and Magdalena Keverich van Beethoven (1744–1787) of Slavic ancestry. Until relatively recently, many reference works showed 16 December as Beethoven's "date of birth", since he was baptized on 17 December and children at that time were generally baptized the day after their birth. However, modern scholarship does not make such assumptions. Beethoven's first music teacher was his father, a musician in the Electoral court at Bonn and an alcoholic who beat him and unsuccessfully attempted to exhibit him as a child prodigy like Mozart. However, others soon noticed Beethoven's talent. He was given instruction and employment by Christian Gottlob Neefe, as well as financial sponsorship by the Prince-Elector. 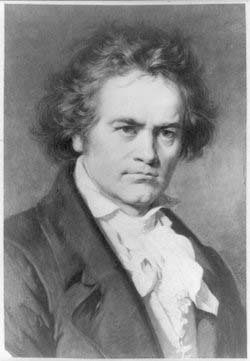 Beethoven's mother died when he was 17, and for several years he was responsible for raising his two younger brothers. Beethoven moved to Vienna in 1792, where he intended to study with Joseph Haydn, but the old man had little time for teaching and he passed Beethoven onto Johann Albrechtsberger. He quickly established a reputation as a piano virtuoso, and more slowly, as a composer. He settled into the career pattern he would follow for the remainder of his life: rather than working for the church or a noble court (as most composers before him had done), he was a freelancer, supporting himself with public performances, sales of his works and stipends from members of the aristocracy who recognized his ability. Beethoven's career as a composer is usually divided into Early, Middle, and Late periods. In the Early period, he is seen as emulating his great predecessors Haydn and Mozart, at the same time exploring new directions and gradually expanding the scope and ambition of his work. Some important pieces from the Early period are the first and second symphonies, the first six string quartets, the first two piano concertos, and the first twenty piano sonatas, including the famous Pathétique and Moonlight. The Middle period began shortly after Beethoven's personal crisis centering around deafness. The period is noted for large-scale works expressing heroism and struggle; these include many of the most famous works of classical music. Middle period works include six symphonies (Nos. 3–8), the last three piano concertos and his only violin concerto, five string quartets (Nos. 7–11), the next seven piano sonatas including the Waldstein, and Appassionata, and Beethoven's only opera, Fidelio. Beethoven's Late period began around 1816 and lasted until Beethoven died in 1827. The Late works are greatly admired for and characterized by their intellectual depth, intense and highly personal expression, and experimentation with forms (for example, the Quartet in C Sharp Minor has seven movements, while most famously his Ninth Symphony adds choral forces to the orchestra in the last movement). This period includes the Missa Solemnis, the last five string quartets and the last five piano sonatas. Considering the depth and extent of Beethoven's artistic explorations, as well as the composer's success in making himself comprehensible to the widest possible audience, the Austrian-born British musician and writer Hans Keller pronounced Beethoven "humanity's greatest mind altogether". Beethoven's personal life was troubled. Around age 28, he started to become deaf, which led him to contemplate suicide (see the 1802 Heiligenstadt Testament). He was attracted to unattainable (married or aristocratic) women, whom he idealized; he never married. Some scholars believe his period of low productivity from about 1812 to 1816 was caused by depression resulting from Beethoven's realization that he would never marry. Beethoven quarrelled, often bitterly, with his relatives and others (including a painful and public custody battle over his nephew Karl); he frequently treated other people badly. He moved often and had strange personal habits, such as wearing filthy clothing even as he washed compulsively. He often had financial troubles. Many listeners perceive an echo of Beethoven's life in his music, which often depicts struggle followed by triumph. This description is often applied to Beethoven's creation of masterpieces in the face of his severe personal difficulties. Beethoven was often in poor health, especially after his mid-20s, when he began to suffer from serious stomach pains. In 1826 his health took a drastic turn for the worse. His death the following year was attributed to liver disease, but modern research on a lock of Beethoven's hair taken at the time of his death, and a few pieces of his skull shows that lead poisoning could well have contributed to his ill-health and ultimately to his death (the levels of lead were more than 100 times higher than levels found in most people today). The source of the lead poisoning may have been fish from the heavily polluted Danube River and lead compounds used to sweeten wines. It is unlikely that lead poisoning was the cause of his deafness, which several researchers think was caused by an autoimmune disorder such as systemic lupus erythematosus. The hair analysis did not detect mercury, which is consistent with the view that Beethoven did not have syphilis (syphilis was treated with mercury compounds at the time). The absence of drug metabolites suggests Beethoven avoided opiate painkillers. Beethoven continued working on his music until he died in March 1827. His last musical sketches belong to the composition of a string quintet in C Major. Beethoven is viewed as one of the most important transitional figures between the Classical and Romantic eras of musical history. As far as musical form is concerned, he built on the principles of sonata form and motivic development that he had inherited from Haydn and Mozart, but greatly extended them, writing longer and more ambitious movements. But Beethoven also radically redefined the symphony, transforming it from the rigidly structured four-ordered-movements form of Haydn's era to a fairly open ended form that could sustain as many movements as necessary, and of whatever form as necessary to give the work cohesion. The work of Beethoven's Middle period is celebrated for its frequent heroic expression, and the works of his Late period for their intellectual depth. See also History of sonata form and Romantic music. Beethoven was much taken by the ideals of the Enlightenment and by the growing Romanticism in Europe. He initially dedicated his third symphony, the Eroica (Italian for "heroic"), to Napoleon in the belief that the general would sustain the democratic and republican ideals of the French Revolution, but in 1804 tore out the title page upon which he had written a dedication to Napoleon, as Napoleon's imperial ambitions became clear, renamed the symphony as the "Sinfonia Eroica, composta per festeggiare il Sovvenire di un grand Uomo", or in English, "composed to celebrate the memory of a great man". The fourth movement of his Ninth Symphony features an elaborate choral setting of Schiller's ode An die Freude ("To Joy"), an optimistic hymn championing the brotherhood of humanity. Scholars disagree on Beethoven's religious beliefs and the role they played in his work. continuing controversy surrounding Beethoven is whether he was a Romantic or a Classical composer. As documented elsewhere, since the meanings of the word "Romantic" and the definition of the period "Romanticism" both vary by discipline, Beethoven's inclusion as a member of that movement or period must be looked at in context. If we consider the Romantic movement as an aesthetic epoch in literature and the arts generally, Beethoven sits squarely in the first half along with literary Romantics such as the German poets Goethe and Schiller (whose texts both he and the much more straightforwardly Romantic Franz Schubert drew on for songs) and the English poet Percy Shelley. He was also called a Romantic by contemporaries such as Spohr and E.T.A. Hoffman. He is often considered the composer of the first Song Cycle and was influenced by Romantic folk idioms, for example in his use of the work of Robert Burns. He set dozens of such poems (and arranged folk melodies) for voice, piano, and violin. If on the other hand we consider the context of musicology, where Romantic music is dated later; the matter is one of considerably greater debate. For some experts, Beethoven is not a Romantic, and his being one is a myth; for others he stands as a transitional figure, or an immediate precursor to Romanticism, the "inventor" of the Romantic period; for others he is the prototypical, or even archetypal, Romantic composer, complete with myth of heroic genius and individuality. The marker buoy of Romanticism has been pushed back and forth several times by scholarship, and it remains a subject of intense debate, in no small part because Beethoven is seen as a seminal figure. To those for whom the Enlightenment represents the basis of Modernity, he must therefore be unequivocally a Classicist, while for those who see the Romantic sensibility as a key to later aesthetics (including the aesthetics of our own time), he must be a Romantic. Between these two extremes there are, of course, innumerable gradations. Listening to Beethoven's music yields another possible scholarly analysis: there is definitely an evolution in style from Beethoven's earliest compositions to his later works. The young Beethoven can be seen toiling to conform to the aesthetic models of his contemporaries: he wants to write music that is acceptable in the society of his days. Later, there is much more iconoclasm in his approach, like adding a chorus to a symphony, where a symphony had until then only been a purely instrumental genre. This means that the question changes from whether Beethoven was a classicist or a romantic, to: where is the pivotal moment that Beethoven tilted from dominant classicism to dominant romanticism?. Most scholars seem to concur: the presentation of the 5th and 6th symphonies in a single concert in 1808 is probably closest to that pivotal point. In the 5th symphony, he let a short pounding motto theme run through all movements of the composition (unheard of until then). Then the 6th symphony was the first example of a symphony composed as "program music" (what in Romanticism became standard practice), and it broke up the traditional arrangement of a symphony in four movements. Yet, after that, Beethoven still wrote his very "Classical" 8th symphony and some innocent-sounding chamber music for the English market. However, by the end of the first decade of the 19th century, Beethoven the romantic was without a doubt primary. In contrast, Carl Dahlhaus argues that the evolution of Beethoven's style actually takes him past Romanticism to a place where he was separate from the music of his contemporaries. Dahlhaus points out that our understanding of Beethoven as a Romantic composer derives largely from Beethoven's early middle period, which contains the Symphony No. 3 and Symphony No. 5. Beethoven's impact on other Romantic composers, however, is taken largely from works between Ops. 74 and 97, of the second half of the so-called middle period. Dahlhaus argues that the tradition of Romantic music is essentially a tradition of Schubertian music, and that Beethoven's influence on Schubert is largely taken from Ops. 74 to 97. By the time Beethoven reaches the late period, he is such an individual as to be best understood as no longer belonging to the same genre as his Romantic contemporaries.